How do you book a plane ticket from Delhi to Mumbai? You start your PC or laptop and open MakeMyTrip or Yatra.com. Would you like to know of a better and cooler way where you might also be able to snag a discounted fare too while being confined to the comfortness of your smartphone? Why, you download the nifty app called Skyscanner and let it do the dirty work. Featuring a nice yet simple layout, you just enter your destination, date and wait for the fares to come. Once the search is complete, click on the fare to get more details and you will find fares being compared from multiple sites like Expedia, Travelocity, Ezeego and lots more. Then there's the option of looking at a graph of the lowest fares close to the departure days to just let you snag that exciting airfare deal. 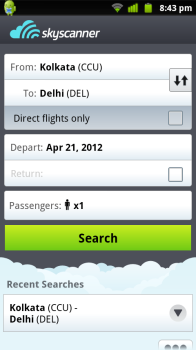 And in all, its a must have app for every person with an Android smartphone and even more for a regular sky traveler. Sleep problems? You simply do not want to wake up early in the morning and be all grumpy on everyone. So how can you wake up early feeling fresh, no grogginess and a willingness to get out of the bed and get to work? Why, you simply grab your Android phone, download the app called Sleep as Android and sleep with peace. It is basically a sleep tracker and when you place the phone near your pillow while you sleep, it will track your lightest phase of sleep by your movements and wake you up within a 30 minutes time frame of your alarm time. Natural alarm tones just make the waking up part more soothing and relaxing. And with an advanced alarm disabling system in which you either have to scan a QR code, or you need to shake the phone till a specific countdown or solve a maths problem, this alarm is sure to just wake you up. I have been a horrible sleeper but since this app, I just can't fall asleep or be late for work because I was able to sleep nicely. Good days are just a few bucks away with this app. 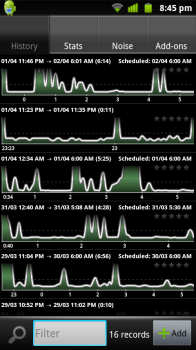 There is another feature which may be more of an analysis thing, the app can record your sound when you talk or make loud noises while sleeping in the night. So if someone tell you that you snore, just fire away the app and prove him/her wrong. UCweb has updated the UC Browser for android with some new features. Want to know what are the newly updated features of version 9.6? Here is for you. There is no one way to manage your finances and track investments. In order to manage your finances effectively there are Android apps that you can use on everyday basis. Moneyview is one such app that you can use to log your income and track spending. In this article, we are going to review Moneyview Android App. Investing into mutual fund is tricky. FundsIndia platform makes it easy for you to handle investments. FundsIndia also has an app for Android users. Using this app investment can be easily managed and tracked. In this article, we'll check out the features of FundsIndia platform app.